The explanation of particles, photons and forces starts with an explanation of energy. Everything around us is energy. Matter is energy, light is energy, heat is energy. In physics, energy is defined as: the capacity or power to do work, such as the capacity to move an object by the application of force. Furthermore, the first law of thermodynamics states the conservation of energy rule: energy is neither created nor destroyed but may transfer from one form to another. The study of energy is intricately linked to physics, and more recently, research in particle physics. It was back in 1905 when the famous relationship between energy and mass was introduced by Albert Einstein (E=mc2). It’s been a century since Einstein wrote his papers on relativity, yet the connection with matter and how energy is transferred between forms remains a mystery. What is energy? How does it change forms? In simplest terms, energy is the motion of the universe which travels as waves. An analogy is a pool of water. Imagine that the pool is flat and stationary. There is no movement of water molecules in any direction within the pool. There is no energy in the pool. Zero energy. Next, imagine that something violently shakes the pool such that water molecules begin to move and collide with each other. The vibration of water molecules is periodic such that waves are formed. Now, the pool has energy. This energy has the ability to move objects with force, such as a beach ball on the water’s surface. The fabric of space, and the energy it contains, is similar to the example of water molecules. It’s logical to assume that atoms and molecules follow the pattern of the building blocks that are the cause of their creation and motion. From water molecules creating waves, to air molecules that cause sound waves, to the molecules in Earth’s surface when an earthquake strikes and travels as waves, there are many examples of something in physical space that is oscillating. And it’s not limited to molecules. In empty space, light travels as waves across the universe. So do gravitational waves. Something must exist to allow space to carry this energy in the form of waves. It will be shown that two components filling space can explain energy and its forms that we see as particles and photons. For more than a century, there has been a belief that waves cannot travel through a medium in space due to an experiment in 1887 that failed to detect a medium known as the aether. If we assume that something must exist in space to carry this energy – and that perhaps it may be impossible to detect an aether given that we are constructed from this substance – then it becomes easier to explain the universe in which we live. At a granular level of space, likely around the size of Planck length, is a substance that moves and collides to transfer energy from one to the next, similar to the motion of aforementioned water molecules and air molecules. In this case, this incredibly tiny component of space is referred to as a granule, after Gabriel LaFreniere who coined the term. In any given volume, the energy into the volume will be the same as the energy out of that volume. Granules collide and transfer energy from one to the next, in a forward motion like two billiard balls colliding. But the overall energy in that volume is always conserved. The structure of space must be packed such that individual granules are displaced from equilibrium, collide to transfer energy, and return to their original position. This oscillation is seen in molecules and is the formation of waves. The fabric of space should be no different. It is nature repeating itself as it builds from the smallest of particles to atoms and molecules. These oscillations form waves that travel in space, yet it is the motion of each individual granule that is calculated to determine energy. Whereas the fabric of space transfers energy in the direction of wave propagation (i.e. forward), there is a second component of space that reflects this energy (i.e. reverse), equivalent to a water molecule bouncing off a beach ball, or an air molecule bouncing off a balloon, or a billiard ball hitting a wall and reflecting. This component of space is referred to as a wave center, after Dr. Milo Wolff who coined the term. It will be shown that this is the fundamental particle that forms other particles. 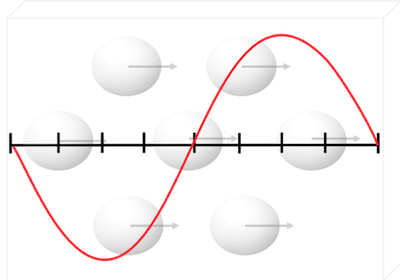 The fundamental cause of particle creation and all forces is a simple rule that wave centers move to minimize wave amplitude. Like a beach ball in an ocean that moves to the point of minimal water wave amplitude, all particles follow this rule. Everything that we see and experience with our senses is based on waves. Our eyes are tuned to electromagnetic waves with certain frequencies, known as light. Our ears are tuned to the vibration of air molecules at certain sound wave frequencies. Our sense of touch is based on electric forces between particles, which travel as waves. 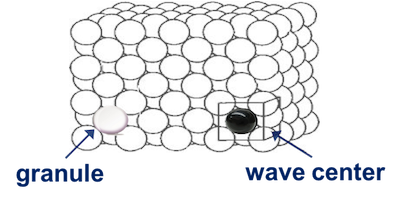 It is our perception of different types of waves and their form that is the cause of how we’ve categorized them into particles, photons (light, etc) and forces.